Conan O’Brien and Andy Richter replaced Immortan Joe and The Doof Warrior from Mad Max: Fury Road for a short Comic-Con clip. 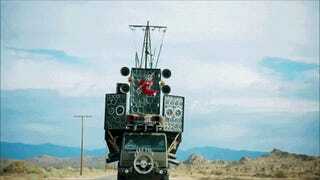 They’re on the road but they should seriously arrive there with Conan messing around with the flamethrower-guitar on top of the Doof Wagon. It’d be some serious cosplay.